European Memories: Travels and Adventures Through 15 countries (Travels and Adventures of Ndeye Labadens Book 4) by Ndeye Labadens takes readers on an exciting trip through 15 countries and serves as a guidebook that will come in handy while visiting these countries; Belgium, Denmark, France, Finland, Germany, Ireland, Italy, Luxembourg, Norway, Portugal, Spain, Sweden, Switzerland, the United Kingdom, and the Vatican. The author takes readers into each country by introducing the country first, and then gives reasons why the country should be visited, and then speaks about the country’s culture, encouraging readers to discover distant new lands. Each European country has its own charm and history that sets them apart from each other and the author captures this beautifully through the book. I like the way readers are taken through these 15 European countries in an elegant, concise, and methodical way, and this makes it a good book to have while traveling to these places. The essence, culture, sights and sounds, places of interest, people, and food of each of these countries will make readers want to visit at least a few of them. I wish the author had provided readers with pictures so that the images described will be etched in their memories forever. This book is a must-read for all travel enthusiasts and also for those who love to read about other countries and become familiar with their culture and customs. The book has been presented well, including just the right amount of description and details, thereby keeping readers' interest till the very end. So have you decided which country in Europe you want to visit first? I have! I loved this book. It just bounces along with the author/narrator not only describing the scenery but adding her difficulties and challenges as she marches through some of the most beautiful cities in Europe. I also love that she includes videos here and there that add to the ambiance that she creates with her writing. If you didn't plan on taking a trip before reading this, book you certainly will afterward. Good book! 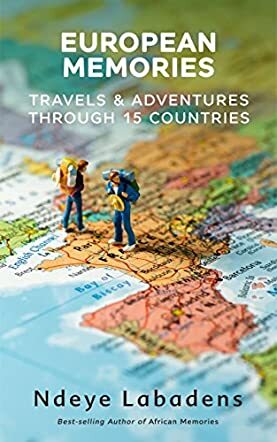 A wonderful, comprehensive book that unlike many others travel books which only cover one destination, here the author covers all the main European destinations. I am European living abroad. Reading this book made me feel like home. It is such an amazing journey and you can explore interesting places, meet amazing people and get to know many surprising facts. IT was such a great and fast read. Wow, Thank you for bringing to e some memories!